Need an easy solution for extra kitchen storage? Then browse our range of 1970mm flat pack kitchen storage units, available in a choice of five finishes and made with PVC-edged 18mm Finsa board. 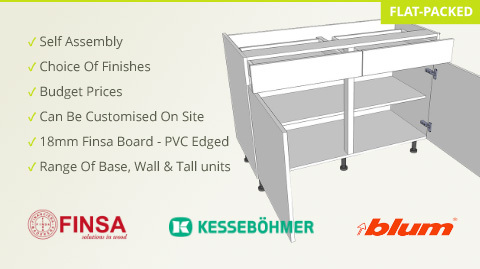 High quality and constructed with value in mind, our storage units are easy to assemble; if you’ve never assembled flat pack kitchen units before, then you can follow the fitting guide supplied with each unit.